Vimbai moves into a dilapidated house in the dunes, trying to escape her embarrassing immigrant mother, and discovers that one of her new roommates has a pocket universe instead of hair, there is a psychic energy baby living in the telephone wires, and her dead Zimbabwean grandmother is now doing dishes in the kitchen. When the house gets lost at sea and creatures of African urban legends all but take it over, Vimbai has to turn to horseshoe crabs in the ocean, to ask for their help in getting home to New Jersey. The House of Discarded Dream is one of those books it feels like I've been talking about forever. Ekaterina Sedia has quickly become one of my favorite Fantasy author as she is will to push things in new and sometimes strange directions. The cover treatment this time around is gorgeous and steps away from the look of Fantasy books with more of a lit look that works for Sedia. I love the title font as well as the coloring of the imagery. 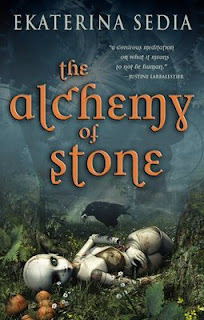 The font is the same used on the recent reissue of The Alchemy of Stone from Prime Books. 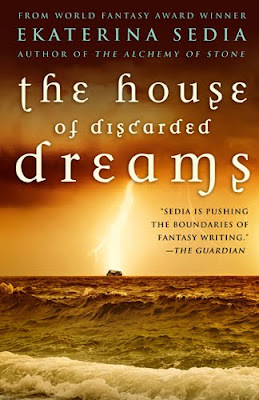 The House of Discarded Dream is set for a November publication from Prime Books.